The X1 is selling well outside the United States, so supplies are tight. BMW will not offer its compact X1 crossover in the United States until the end of 2012 because of strong demand for the redesigned version of the larger X3. Also, the X1 is selling well outside the United States so supplies are tight, said Jim O'Donnell, CEO of BMW of North America. The X1 was launched in Europe in November 2009. 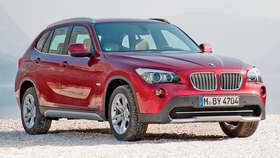 BMW initially planned to sell the X1 in the United States early this year, but delayed it until year end. Now, European and U.S. BMW management have postponed the launch further. O'Donnell said the X1 "was always going to be a niche vehicle" in the United States with forecast sales of less than 5,000 units annually. The redesigned X3 crossover went on sale in January and 5,710 were sold in the first quarter, up from 1,355 a year earlier. BMW sold only 6,075 X3s last year. O'Donnell says U.S. sales of the X3 could reach 25,000 this year. The X3 peaked at 34,604 units in 2004. "It is very hot -- and hot all over the world," O'Donnell said. "My only risk is they may divert units to China and Germany." The X3 is striking a chord with buyers, he says, because it is bigger than the previous generation -- nearly as large as the original X5. The new X3 is produced in Spartanburg, South Carolina. The previous version was built in Austria.